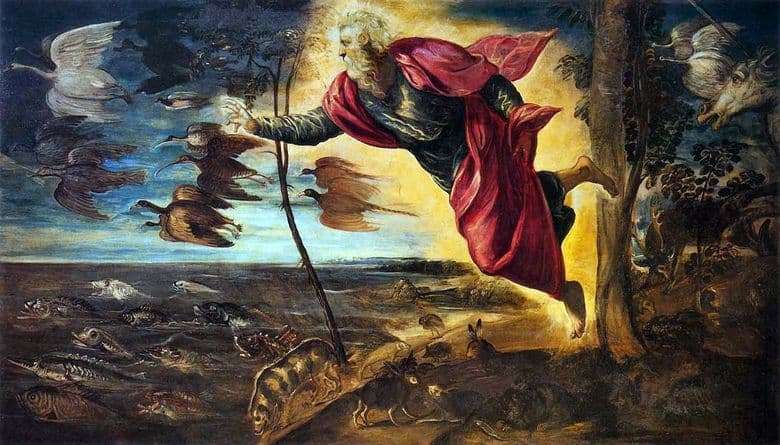 On the canvas by Jacopo Tintoretto depicts a classic bible plot. The artist opens up for us, the audience, a veil of secrecy and allows us to see the moment of the creation of the world. The main role on the canvas is, of course, assigned to the figure of God. Artists rarely found the strength to take on the image of the great Creator, but Tintoretto took up this work with obvious admiration and boldness. It is believed that for Tintoretto the most important thing was to convey to people the meaning of the picture and the plot. In the center we see the figure of God. He stretched out his right hand forward, as if making his way and indicating the direction of the surrounding creatures. God soars above the earth. Around – the eagle of majestic golden light, which further emphasizes the solemnity and importance of the moment. The clothes of the Creator slightly develop in the wind, as the drapery of the fabric tells us skillfully traced. Red cape – the brightest spot on the canvas. The artist depicts three habitats of animals – water, sky and earth. Moreover, all these “worlds” are carefully separated from each other. The sky and the water are separated by a horizon line. Animals that live on land, as if the tree is blocking the road and does not allow to approach the water. It seems that the artist depicted three completely different worlds, universes that are united by the image of God. Flocks of various birds fly in the sky. It is important to note that all the birds fly by two, which refers us to the phrase from the Bible: “every creature has a pair”. Tintoretto always lived near the reservoirs, so the fish is of particular interest to the artist. The master skillfully painted every inhabitant of the sea, carefully depicting various types of fish. Here sturgeon, crucian carp, perch, pike are guessed. The remaining animals are not drawn in such detail. The nature in this picture was not of particular importance for the artist, so we see a little messy strokes that create only the outlines of the shore, trees.